Strapping into your paramotor on the ground and setting the hang angle is super important. 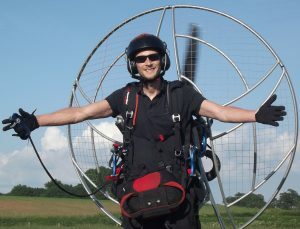 A hang test should be done before taking your first flight, or whenever you fly a different paramotor. Hang tests are essential for safe flight and neglecting them could lead to dangerous takeoffs and landings, and riser twist. Setting the hang angle is easy to do, but trying to guess the angle while strapped in is difficult. I recommend you have somebody with you to tell you what angle you're at or to take pictures for you to assess. If nobody is available you could film yourself and watch back to check the angle. 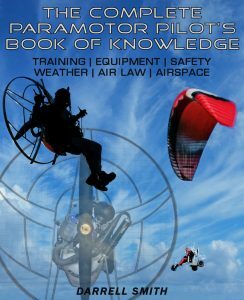 You'll need to emulate an actual paramotor flight so before doing your hang test you need to setup as if you're really going flying. Fill the tank half way up with fuel, attach your reserve parachute, wear your helmet, flight suit, etc. This will ensure that you're the same weight during the hang test as you'll be during an actual flight. A hang test is also a good opportunity to practice things that you'll have to do during a flight. One good example is getting into (takeoff) and out of your harness (landing). My friend was struggling to get into his harness and had to abort two flights because he just couldn't manage to get in. We got him up on the hang test and figured out where he was going wrong. We adjusted his harness and he practised different methods of pulling himself into his harness, he never had anymore problems. You can also move around in the harness to practice weight shift turns. Watch how the bars move and figure out how much you need to lean. Practice reaching for your reserve handles to make sure they're easy to grab if you ever need too. And when your parachute is ready for repacking you could even throw it, this is great practice and should be done by every pilot. For my hang tests I use an A-frame engine crane, but you can use anything that's strong enough and allows you to attach a paramotor. You may need to get a little creative if you don't have any type of A-frame handy. Things like tree branches, wooden beams in buildings, children's swings all make great hang tests. If you're still stuck you can purchase a swing frame fairly cheap, you'll need it again in future so it's definitely worth it. Something like this frame on Amazon would be perfect for a hang test > A-frame. Or if you're handy with a little metal/wood work you could easily make your own! To make the job easier you can get ready made steel brackets that simply bolt to the timber, like these on Amazon > A-frame brackets. When you have the frame you can simply tie two pieces of rope around it at the same lengths to attach the paramotor. Make sure your knots are good as you don't want them coming loose, if they slip you'll risk damaging your paramotor. Use strong rope and non slip knots as explained here > Non Slip Mono Knot. You can also use ratchet straps like I used in the main image at the top of this page. Just be sure to wind plenty of the strap around the ratchet so it doesn't slip through. You will also need to use good heavy duty straps as the cheap ones can easily break and cause damage to your equipment. Now you have the frame set up you can go ahead and hook-up the paramotor. If nobody else is available don't forget to start filming from the side view so you can check the angle. When you stop swinging observe the angle and use the images to decide whether you're settings are correct. If you're leaning forward as in the first image you'll need to move your hang points forwards. Neglecting a hang test and flying in this position can make launches and landings very difficult. It also brings the cage very close to the risers increasing the risk of a brake handle being sucked into the propeller. Flying a paramotor that's leaning to far back as in the third image is also very dangerous. You'll find it harder to run during launch and the torque effect will be dramatically increased which can result in riser twist. To correct this move your hang points back. The correct angle is shown by the centre image. You can adjust the hang angle to lean slightly more forward than shown, but no further back. Remember, when you're flying under power the thrust will naturally cause you to pivot under the wing. This pivoting will cause you to lean back even further, so it's important to get this right. The way in which the hang points are adjusted will vary between manufacturers. Some hang points will be bolted to the bars and some will use thick nylon webbing simply looped and wrapped around the bar. If your paramotor uses nylon webbing like you can see below, you need to be very careful whilst reattaching it. Ensure the webbing is not looped underneath the bars as shown in the first image. There have been cases of pilots making this mistake, the hang points slip forwards after takeoff tilting the pilot back. The pilot ends up facing directly upwards looking at the sky, and at serious risk of riser twist. You can only guess what the landing would be like! After reattaching the webbing double check to make sure they are attached correctly. If your hang points are bolted to the bars you'll simply have to loosen and remove the bolts. You'll then be able to move them forwards/backwards to achieve the desired hang angle using the alternative holes. Tighten the bolts to the correct torque as specified by the manufacturer and double check that they're in the same position on both sides. Keep checking the hang angle and adjusting the hang points until the correct angle is achieved. When you're happy with the angle be sure to check everything is where it should be and that all bolts are re-tightened. 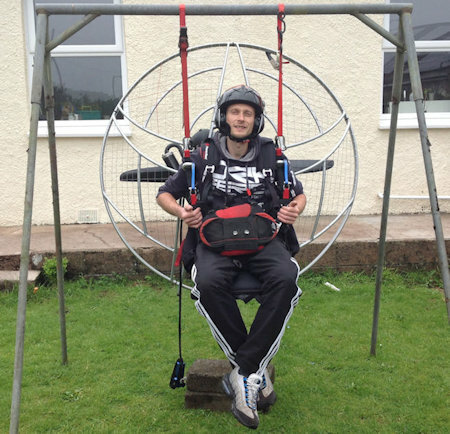 The hang test is now complete and your paramotor is ready to fly. Remember, if you loose or gain weight you may need to do another hang test. Similarly, if you ever carry extra weight during cross country races or fly-camping you may need a hang test first. So there would be no hang point adjustment if your harness has a HIGH hang point as apposed to the LOW hang points this article referred to ? Hi Trent, high hang points can also be adjusted. Some high hang point machines have solid bars that will let you move the carabiners, just like the ones in this post. Others have soft mounts where you just adjust the straps in or out with a simple buckle. I searched for your name but couldn’t see it. In modern paramotor ( bulldog monster 185 ) is the harness adjusted to help with torque compensation or is that done by second loop in risers. Also. How ( high hang point ) important is positioning of the motor ( thrust ) in relation to your seat position. Is position precise within cm,mm,inches or eye it up.